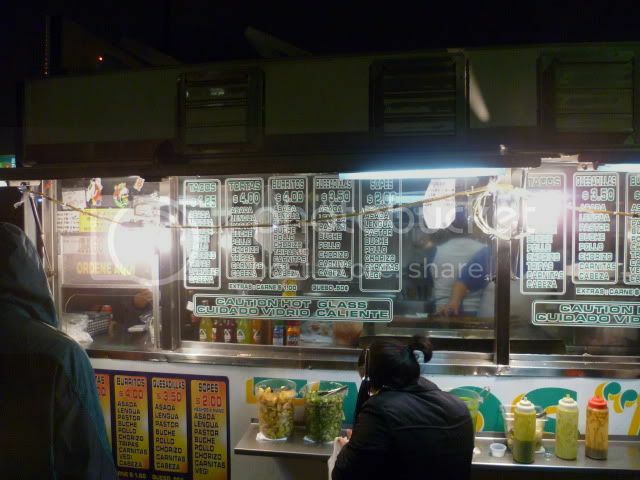 We started in Echo Park and meant to hit up the wildly popular Taco Zone, however they were not parked in their usual parking lot, we figured that perhaps this was due to us being too early or that it was pouring. A rather flashy truck, seemed like a pretty legit operation. My buddy sticks to his order of one al pastor and one carnitas. This seemed like a good route. However, this place had no carnitas. 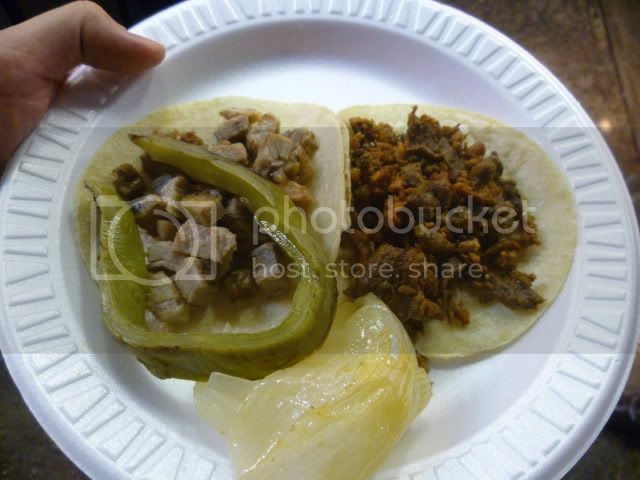 I was suspicious off the bat about good al pastor off a truck and spied no trompo, so I went my own direction. One suadero and one campechano (mixed carne asada and chorizo). Pretty well stocked condiment bar. And the results: The best thing was that strip of grilled nopal. 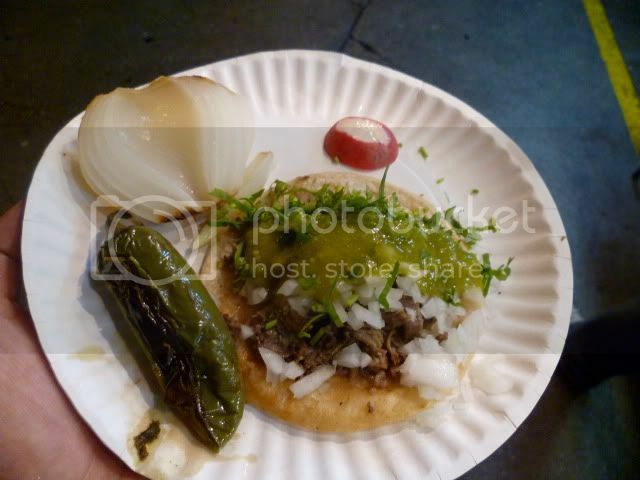 The suadero was not what I am accustomed to- rather than braised and soft barbacoa-like beef, this was weirdly tangy, lifelessly pale pork chunks, not worth the belly space, so I tossed after two bites. The campechano was fine, griddled low-rent steak meat perked up by chorizo (what isn't made more exciting by chorizo). 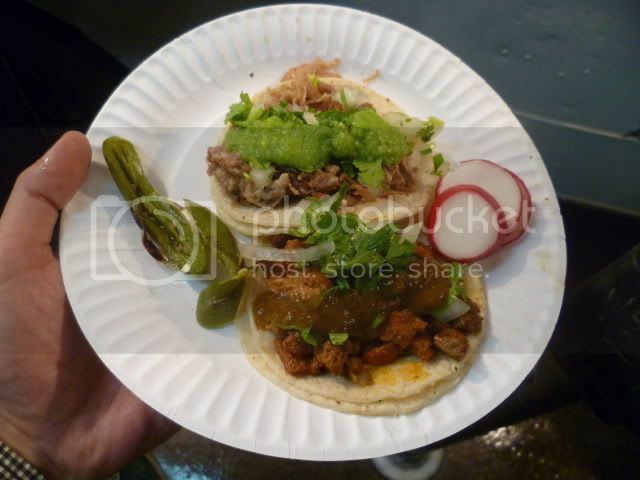 I decided to follow his pattern and go for one carnitas, one al pastor (even with lack of visible cone). A more spartan condiment offering. I do appreciate the presence of radishes everywhere. The mixed onions and cilantro a bit sketchy to me though. The carnitas was fine, soft meat with much of the greatest-thing-about-carnitas crispy bits steamed away. The pastor was, of course, taken from holding dish to griddle for reheat. No char. Good adobo flavor, but isn't the point of pastor the spit charring? 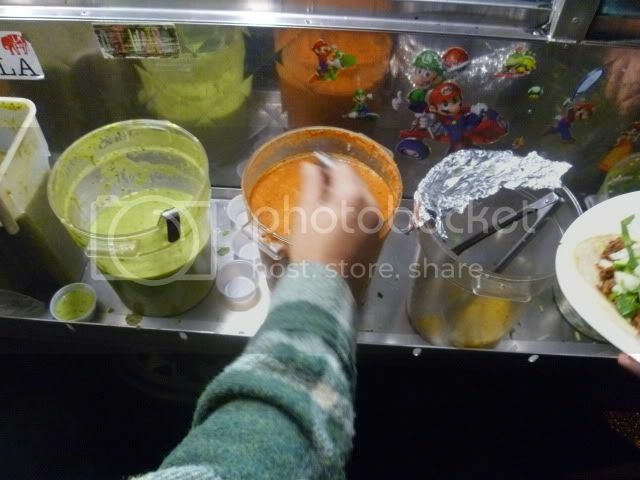 Nice salsas though, the chipotle added a nice zing. Salsa verde fresher tasting than the last place. This was the best taco of the night. Not only did I love that grilled jalapeño, but the taco meat was pretty damn good. Tender and juicy, with occasional moments of gelatinous intrigue. 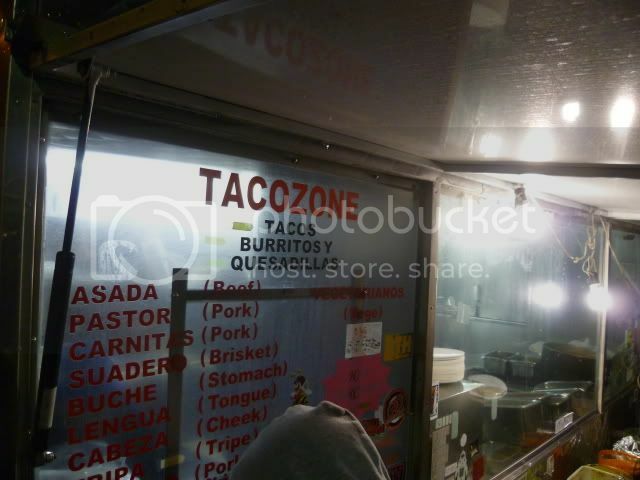 On the way home, we found Taco Zone. It had quite the line. I went with their version of cabeza and carnitas. An almost decimated condiment selection. At this point in the night, my criticality was impaired and things tasted pretty good. The had a heavy hand with the oil on the griddle and the carnitas, while the crispest offering of the night, tasted of grill oil rather than pork fat. The cabeza wasn't anything like the last place (or what I've come to expect from the meat). 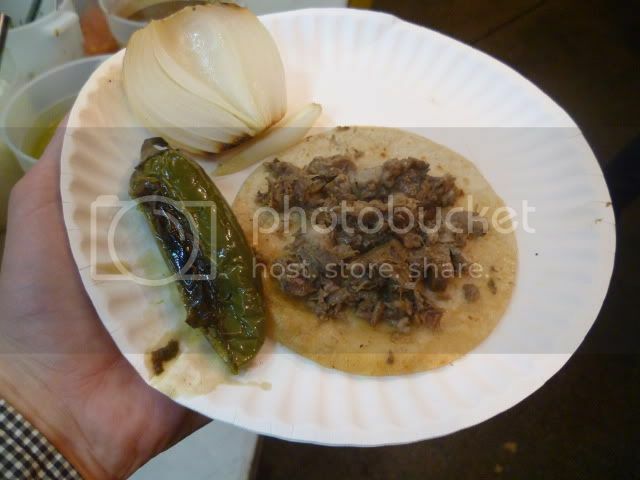 It was like barbacoa or suadero which had been crisped up a bit on the grill. 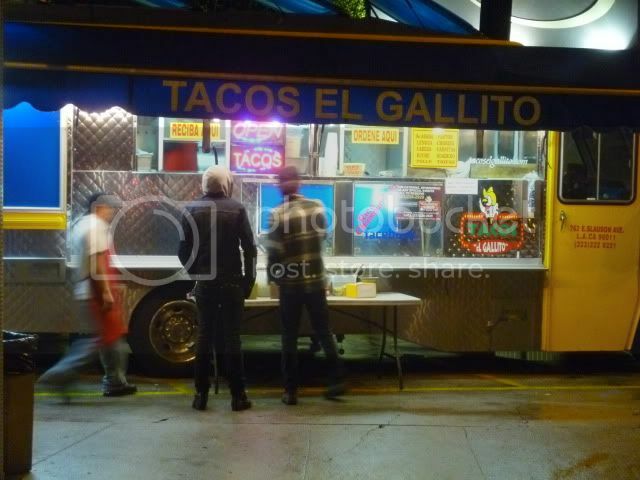 All in all, I don't think that these street tacos live up to their brick-and-mortar counterparts. Its pretty simple to deduce why. 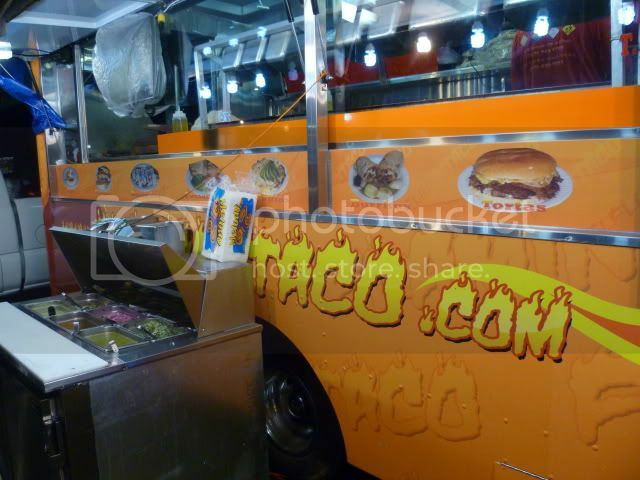 The best grilled taco meat is made fresh to order on live flame, whether that be coals on a grill or on the spit in the case of al pastor. That kind of smoke and heat cannot possibly be contained in a 6' X 12' truck. 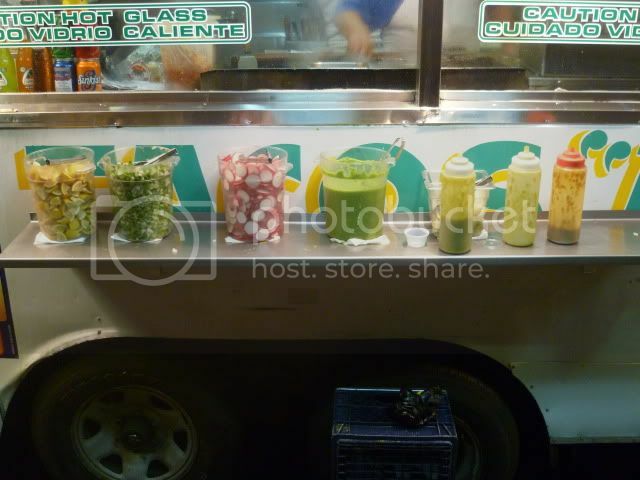 I've had amazing carne asada and al pastor tacos on the streets of Mexico that are cooked in the open air. 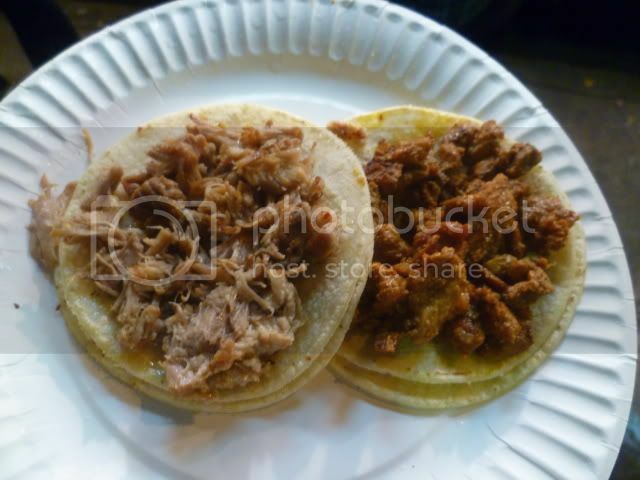 As far as other meats- carnitas can be handled delicately to preserve their crisp and maybe given a quick go on the griddle, but lose the point when held in a vat. 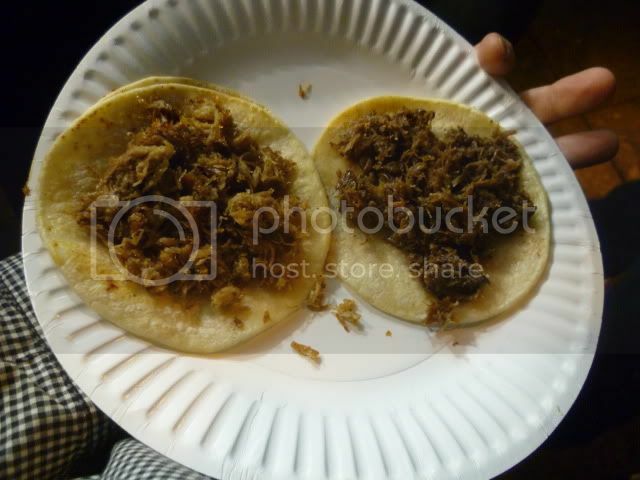 That said, I think soft, braised meats like cabeza, real deal suadero, barbacoa, or even birria would be the way to go in these limited operations. I did notice on some trucks women patting out fresh masa. None of the tacos I ate were served on fresh tortillas. Huaraches and gorditas were not on offer at these places, but sopes were. I'm used to the deep-fried hockey puck version of these, but perhaps they are prepared differently on the trucks, I will try this next time. 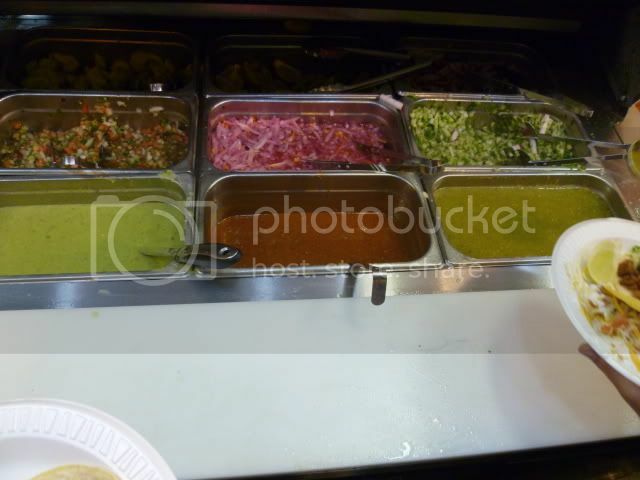 I appreciate the presence of vegetal matter in LA taco culture. 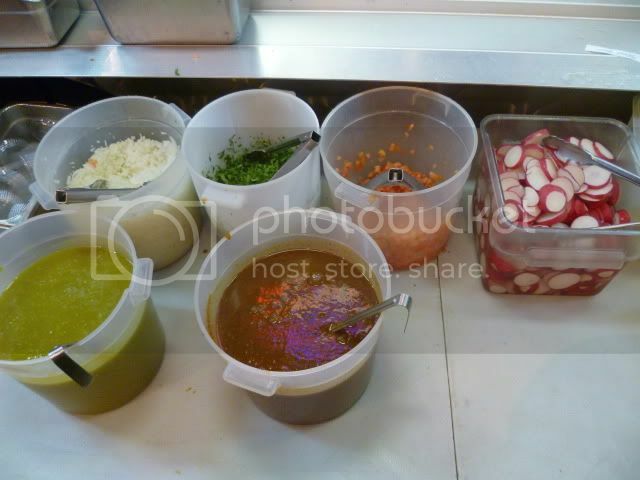 Grilled jalapeños and green onions are de riguer in Mexico, so are fresh discs of radish. Why don't we see more of this in meat-centric Chicago? Jefe wrote: Tender and juicy, with occasional moments of gelatinous intrigue. Dynamite report and images. Many thanks. looks great, wish i was in L.A.